Exhibitors - Jackson Wild: Nature. Media. Impact. Immerse yourself in the lives and struggle of the Munduruku Indigenous People deep in the heart of the Amazon rainforest. Commissioned by Greenpeace UK, Munduruku was shot in the heart of the Amazon rainforest by Alchemy VR and highlights the world of the Munduruku Indigenous People which is currently under threat from planned government construction initiatives. The team spent two weeks living with the Munduruku people, capturing the very essence of tribe life and creating a truly empathic virtual reality experience. BAFTA award winning David Attenborough’s Great Barrier Reef Dive is a fully immersive virtual reality experience produced by Alchemy VR where you dive deep beneath the waves on the Great Barrier Reef, sitting next to your guide, David Attenborough. In a state-of-the-art Triton submersible you dive through a wonderland with over 3000 reef systems forming one of the most important natural resources on Earth. It is an extraordinary opportunity to come face to face with the incredible diversity and abundance of the Great Barrier Reef, and learn how researchers are using certain species of corals to predicting how the reef will react to environmental changes. Alchemy VR’s team worked alongside renowned research institutions from across the world including the Australian Institute of Marine Science, James Cooke University and the University of Queensland to showcase the beautiful diversity on the reef and uncover the incredible research being done to decode it. Arnold & Richter Cine Technik (ARRI) is a global company within the motion picture industry, employing around 1,300 staff worldwide. In 2017 ARRI is celebrating its centenary, having been founded in 1917 in Munich, Germany, where the headquarters is still located today. Other subsidiaries exist in Europe, North and South America, Asia and Australia. The ARRI Group consists of five business units: Camera Systems, Lighting, Media, Rental and Medical. ARRI is a leading designer and manufacturer of camera and lighting systems for the film industry, with a worldwide distribution and service network. It is also an integrated media service provider in the fields of postproduction and equipment rental, supplying camera, lighting and grip packages to professional productions. ARRI Medical focuses on the use of core imaging technologies for surgical applications. The Academy of Motion Picture Arts and Sciences has recognized ARRI’s engineers and their contributions to the industry with 19 Scientific and Technical Awards. For locations and more information please visit ﻿www.arri.com﻿. In this cutting-edge walk-around VR experience, travel to a place where the glaciers are melting faster and faster and NASA went to find out why. FRONTLINE and NOVA — two of PBS’s flagship series— teamed up with Emblematic Group founded by the 'godmother of VR' Nonny de la Peña to bring this important story about climate change to life as never before. Produced in association with X-Rez Studio and Realtra. 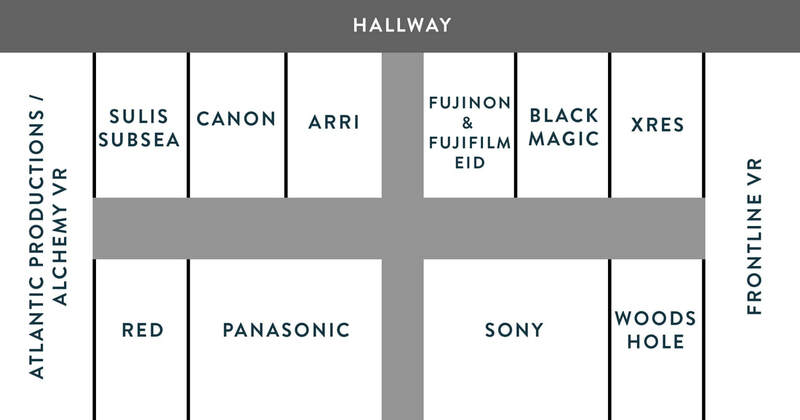 ​Fujifilm/FUJINON is a leading manufacturer of lenses and other high-quality products for Broadcast Television, Documentary, Commercial and Cinematography production markets. Wednesday 10:00-11:00 Acquisition Choices: The VariCam family, HD, 2k, UHD, 4k, HDR, HFR and? RED Digital Cinema is a leading manufacturer of professional digital cameras and accessories. RED's DSMC2 line of cameras - RED RAVEN, SCARLET-W, RED EPIC-W, and WEAPON - combine compact and lightweight design, modularity, superior image quality, and cutting edge performance - including up to 8K resolution. Our unlimited passion for technology, content and services, and relentless pursuit of innovation, drives us to deliver ground-breaking new excitement and entertainment in ways that only Sony can.Creating unique new cultures and experiences. SULIS Subsea Corporation specializes in aquatic camera technology. With a firm belief that the pressures of the deep should not crush your standards, SULIS works directly with leading scientist, engineers, and filmmakers to deliver purpose-built technology. The footage SULIS's cameras produce can be found anywhere from leading science labs to IMAX screens, to streams from ROV control rooms to millions of online viewers. Their mission is to advance marine exploration, discovery and knowledge, by sharing information about the oceans through the most advanced imaging technology. The Advanced Imaging and Visualization Laboratory, AIVL, at the Woods Hole Oceanographic Institution, WHOI, specializes in the development of imaging systems for the acquisition of scientific imagery and documentary footage from the world's most hostile environments, including those found in the deepest parts of the world's ocean. For over 30 years AIVL has been a leader in the development of cinematography quality 2D, 3D, HD and hyper-definition camera systems for both terrestrial and underwater applications. The lab has developed a suite of small, easy to operate underwater stereoscopic camera systems, cinematography remotely operated vehicles as well as many UHDTV, 3D and VR rig designs for use in terrestrial filmmaking and underwater imaging projects.